No library is complete without classics! Here is your chance to enrich your whole family’s entertainment experience by OWNING the 4 Paw magic. 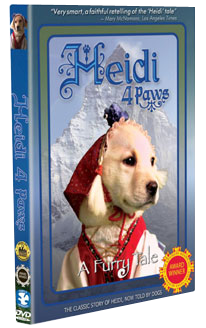 A copy of HEIDI 4 PAWS is a perfect present for birthdays, holidays, or even friends recovering from illness or loss who just need a smile put on their kind face! Send a copy of what BOOKLIST calls “Perfect Family Fare”!